Sensing a need in the community for a Christ-centered program for school age children during the summer three years ago, the Grace staff put together a program that has the excitement of a VBS, the feel of camp, and the Word focus of Sunday School. It is a high activity, full day, daily (Monday to Friday) experience that is designed to present Christ to children, help them grow in obedience and joy, and draw in new families to Grace. According to Sebring staff members, the camp has been incredibly successful, with more than a dozen children committing their hearts to Jesus last season and several families that began to call Grace their church home. The first year, the church invested about $6000 in startup costs and had fewer than ten children. Last year the number was in the low twenties, and the program paid for itself. This year, the staff has grown to four (three interns and a director) and there are nearly forty children at this point in the early summer. 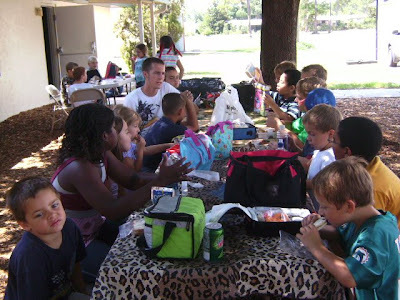 Ryan Gagnon, director of the program says, “Our mission at Ignite Summer Day Camp is to minister to families by filling a need in the community. We offer weekly inclusive field trips to places such as Papa John’s Pizza, the Children’s Museum of Sebring, and Highlands Hammock State Park. We also have a weekly trip to the Sebring High School pool, as well as two additional water slide days per week. “Each week has a different theme that the children learn more about. Some of these themes are the circus, sports, and countries around the world. The children have a weekly memory verse and also a daily Bible story. We do this so as not to lose focus on our primary objective which is the ministry to families.